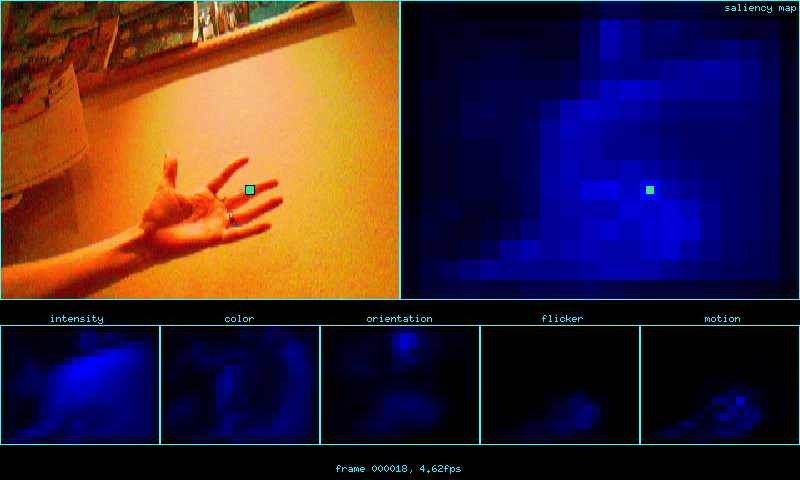 Low-level helper classes, including Point2D, Rectangle, PixRGB<T>, Range, Timer, XWindow, etc. Template Image<T> and ImageSet<T> classes with hundreds of image processing functions and copy-on-write / ref-counting semantics. 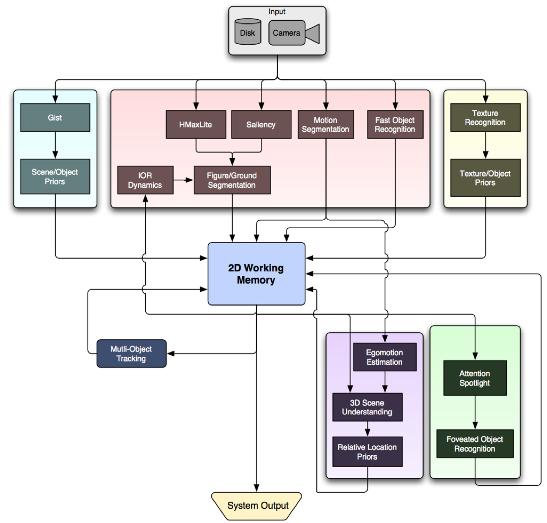 Image I/O functions for read/write to image files or video streams (various formats). Low-level neural network simulation classes, such as LeakyInterator and LeakyIntFire neurons and backprop perceptron classes. High-level neuromorphic classes, including a hierarchy of low-level visual feature Channels for the computation of neural maps responding to color, intensity, orientation, motion, corners, T-junctions, etc; a Winner-Take-All maximum selector network; a Saliency Map network to represent conspicuous locations in a visual scene; a Visual Buffer short-term visual memory endowed with internal competitive dynamics; a Visual Cortex class that orchestrates the computations of a variable collection of feature channels; a Brain class that holds a Visual Cortex, Saccade Controller for the simulation of eye/head movements, Task-Relevance Map to memorize locations of interest in a scene, Shape Estimator to roughly segment objects in a scene, a set of SIFT classes that implement David Lowe's Scale-Invariant Feature Transform model for object/scene recognition, etc. Neuromorphic models of visual attention (to find locations in an image or video stream that are likely to attract the eyes of a human observer or to surprise the observer), contour integration (to simulate how elongated contours are strong attractors of attention in human observers), object recognition (using various strategies including matching feature vectors, backprop perceptrons, hierarchical feedforward feature extraction models, etc), intelligent knowledge-based vidual agents that perform high-level scene understanding, rapid computation of the ``gist'' or coarse semantic category of an entire scene (e.g., indoors vs. outdoors), and many more! Hardware interfacing, to Video4Linux and IEEE-1394 (FireWire) cameras, audio/dsp, serial ports, serial servo controllers, GPS units, etc. This only works under Linux. Parallel processing classes for the simulation of complex models over Beowulf clusters of computers. Neuromorphic modeling environment which facilitates the run-time selection of plug-in model components, the management of persistent model tuning parameters, and the generation/parsing of command-line options for various models based on the collection of model components which they implement. In 2010, we started the Neuromorphic Robotics Toolkit. The main goal was to facilitate the deployment of more complex models that would run on collections of computers with mixed architectures (different CPU models, various CPU+GPU combinations, etc). NRT provides a Blackboard-based message passing architecture that allows one to easily transfer any C++ data structure from one computer to another. When running multiple threads on a single machine, those transfers come at negligible cost (zero-copy of the data), and when they are between physically distinct machines on a network, the framework handles the serialization (or marshalling) of the data transparently (it makes no difference to a user whether a particular model runs on one machine or on a network of machines, except for execution speed). At its heart, the Neuromorphic Robotics Toolkit is a C++ library and a set of tools to help you write high-performance modular software. NRT provides a framework in which developers can design lightweight, interchangeable processing modules which communicate by passing messages. NRT also provides libraries for performing various robotics related processing such as Image Processing, PointCloud Processing, etc. NRT is a C++-14 framework. Modular programming is a technique in which a software system is composed of self-contained, interchangeable components with defined interfaces. Because each module is self-contained, it can be tested independently from the rest of the system. Furthermore, having well-defined interfaces between modules allows researchers to effectively communicate their components' requirements and capabilities to the rest of the team. Transmission of arbitrary C++ data types between modules. You are not limited to a small list of simple types like in many other message-passing frameworks, which often force you to convert your native complex data structures into their simple types. Zero-copy transmission of messages when modules are instantiated on the same machine. Transparent serialization (marshalling) of messages over the network when modules are instantiated on different machines, with no difference to a user or a programmer whether a message is transmitted locally or across a network (apart, of course, from transmission time). Statically (compile-time) defined module interfaces to avoid the sprawling of error-prone, string-based naming of module ports or publish/subscribe topics that plague most existing message passing frameworks. Enhanced ability to re-use modules by allowing (1) generic messages concepts and generic modules that can manipulate any message type (e.g., message queues) and (2) splittable messages such that complex composite messages can be broken down into elementary parts, which may then be processed independently before being re-assembled. The Neuromorphic Robotics Toolkit is our solution to this list of requirements. Beyond these, it also provides a graphical tool for managing and creating networks of connected modules, and a suite of administration tools for starting, configuring, and stopping systems. The core inspiration for NRT is to consider the brain as an agency of concurrent specialized knowledge sources, whereby multiple such sources work together towards solving a complex problem. This vision is not new, and has been implemented in many early artificial intelligence systems, including VISIONS (Hanson & Riseman, 1978), HEARSAY-II (Erman et al., 1980), and Copycat (Hofstadter & Mitchell, 1995). Over time, the specialists hence work together towards a solution. Other groups have also explored schema-based and blackboard architectures in robotics (e.g., Arkin, 1989; Brooks, 1991; Xu & van Brussel, 1997) as well as in cognitive science (e.g., van der Velde & de Kamps, 2006). Here, with NRT we developed the necessary tools to bring these kinds of architectures to a new level of user friendliness through the use of highly modular, transparently distributed, graphical-oriented programming. 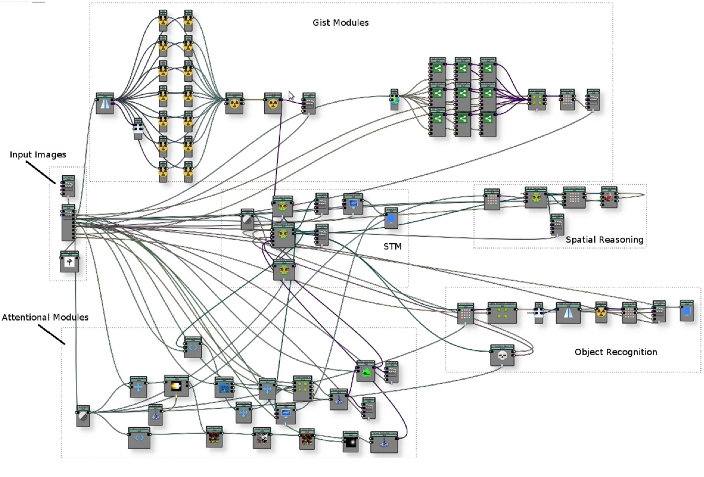 Novice users can assemble complex systems running on collections of computers by simply dragging and connecting software modules (the blackboard agents), where the modules interact via a distributed Blackboard Federation system behind the scenes (connections represent posting/subscribing of/to messages). Similar graphical programming metaphors have proven particularly effective in previous systems, including Khoros/Cantata, AVS (Advanced Visual Systems Inc.), Lego Mindstorms, Flowstone, and many others. While these previous frameworks have often been limited to single-CPU systems and simpler point-to-point information flow between modules, we have used our blackboard-based NRT framework on machines ranging from clusters with 288 CPU cores + 2048 GPU cores, to a single laptop, or even a 10-Watt netbook (Intel Atom). A number of new features allow NRT to eliminate some of the major caveats of similar previous systems, described throughout this documentation. Initial development of NRT started under the DARPA Neovision2 project. 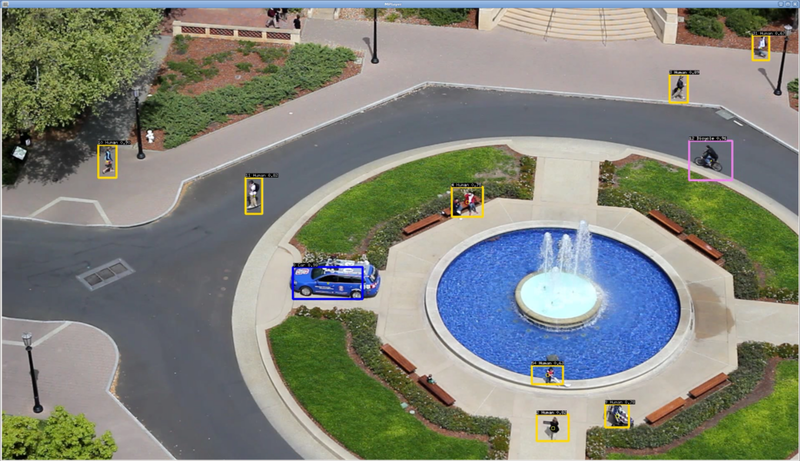 NRT was developed to allow us to build a neuro-inspired machine vision system that can attend to, track, and recognize up to 10 object categories (cars, trucks, boats, people, etc) in high-definition aerial video. Above: Flowchart of how different visual processes may give rise to visual scene understanding. Above: Corresponding implementation as a large NRT system. Above: Sample system output. Cars are marked in blue, people in yellow, cyclists in pink. The JeVois framework benefits from our previous research with INVT and NRT. It is mainly geared towards embedded systems with a single processor, and towards stream-based processing (one image in form the camera, one image out to USB). Many of the innovations which we have developed for INVT and NRT have been ported to JeVois, including chiefly the ability to construct complex machine vision pipelines using re-usable components which have runtime-tunable parameters, and providing a framework to ease the development of new components and their parameters. JeVois is a C++-17 framework. Some features of our previous frameworks have been dropped but could be quite easily added, including a powerful Image class template (JeVois only provides a minimal RawImage class, and conversions to OpenCV's image class), blackboard architecture, and message passing including serialization. New features specific to JeVois include kernel-level USB Gadget driver, kernel-level full-featured camera chip driver, user interface classes, and a new Engine component to orchestrate the flow of data from camera to processing to output over a USB link. These features are presented in more details throughout this documentation. JeVois is open-source (GPL license). Development of JeVois was in part made possible through a research and outreach grant from the National Science Foundation, Expeditions in Computing program.